The Ferrari team have undergone yet another reshuffle as they try and boost their championship chances ahead of the 2015 Formula One season. 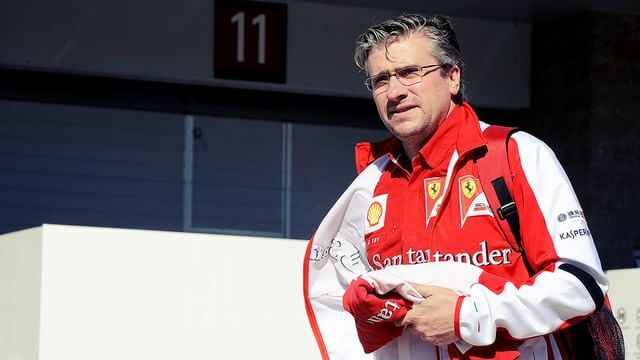 With new boss Maurizio Arrivabene reorganising the technical department, both Pat Fry and Nikolas Tombazis have been confirmed as leaving the Scuderia. James Allison takes on the technical director role - a single role that had previously been split into chassis and power unit. Beneath him, the departments remain, with a chief designer, a power unit director and more. James Allison continues to direct trackside operations but it’s likely this role will be filled by someone else in the near future. The team have also created a new Commercial Department, which will be headed up by Arrivabene himself for now, with their head of Press joining as Marketing Manager. Meanwhile, Alberto Antonini, an Italian F1 journalist, takes over the press role and heads up a brand new Scuderia Ferrari digital team. Which probably has something to do with their Twitter name changing from InsideFerrari to ScuderiaFerrari.